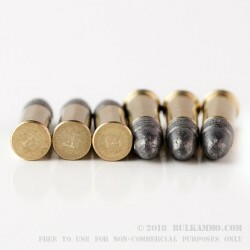 Silence has long been characterized as the golden rule, and with the introduction of the Federal 40r .22 Long Rifle Gold Metal Target, it is now also one of the most lethal. 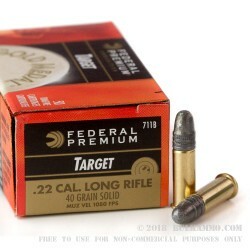 The Federal 40gr .22 Long Rifle Gold Metal Target uses the same precision measured propellants as Federal’s large caliber match ammunition, now packed into a rimfire cartridge. This provides consistent and accurate shoot groups universally across all ammunition lots, regardless of date of manufacture. 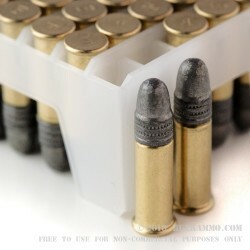 For target shooters who careers depend on the consistent performance of their rounds, there is no better alternative short of hand loading your own ammunition. At at designed bullet velocity of 1.080 feet per second, the Federal 40gr .22 long rifle Gold Metal Target is ideal for suppressor applications, or property owners looking to repel varmints while not drawing attention to themselves using louder ammunition at higher velocities. 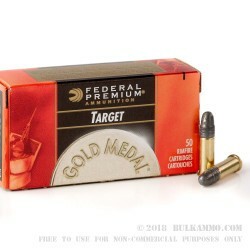 Weather you are looking for consistency or performance, the Federal .40 gr .22 long rifle Gold Medal Target is the perfect round for you target practice needs. A: Hello Kevin, Federal lists the muzzle velocity of this round at 1080 fps.